Today, I will introduce to you another interesting place from many Vietnam Popular Destinations. This place is Ho Chi Minh Post (Buu Dien Thanh Pho Ho Chi Minh). If you are planing to visit Vietnam, I hope this info will useful to you. After attacking the Gia Đinh’s palace, taking the Sai Gon area (old name of Ho Chi Minh City). The French set up immediately one communication infrastructure to contact each other. On 11-11-1860, the first post office was opened at the central of the city. 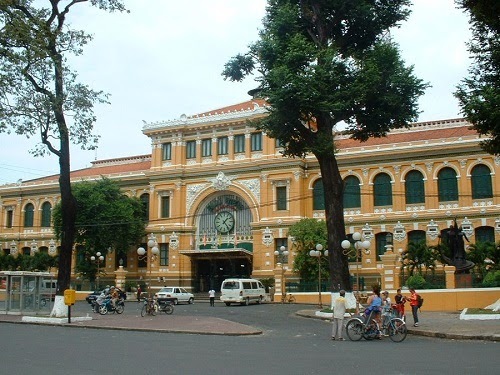 The first stamp in Vietnam was released at this post office on 13-1-1863. The name of this stamp was “stork” (one of signal of transferring letter of Vietnamese people in the past). The post office is one of popular architecture in city; it is a combining of classy style from Europe and amazing style of Asian. 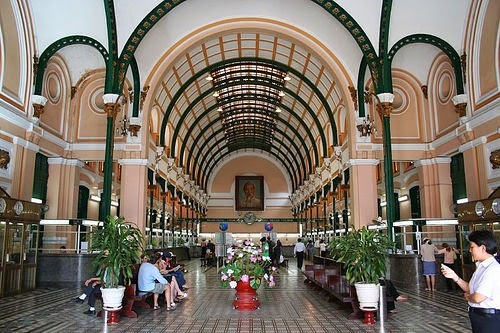 The structure is located on the Paris boulevard district 1 near the Ho Chi Minh Notre Dame. After this building was built, it became one strange service and made strong impression to the citizens. The amazing beauty of the building is crowned in high level by the splendid of Notre Dame. From the past to now, the building has been the central post office of the city. It has a highly balance and beauty in single detail. And this is why here is one of Vietnam Popular Destinations. With many Vietnam Popular Destinations like this place, you could see each feature is divided equally through a main column system. The front of the structure has shape design, but the door has arch shape above them. The column system like head, subsections column and awing structures has square shapes. On the top level of each column is carved pattern and reliefs carefully. Inside the building, there is one main arch near the main door and one long arch is stretch from the door to the end. The main arch is supported by four main steel columns and the long arch is supported by long small steel which is put in two sides of the building. Due to the arch system, the building is looked high, big and cool. Moreover, there are two historical maps inside the office. They are called “Saigon et ses environs 1892” and “Lignes telegraphiques du Sud Vietnam et du Cambodge 1936”. Today, there are some building which was built for storage, installation of machinery and equipment for communication purpose. To sum up, here is some details about Ho Chi Minh Post. I hope with this post can give you some useful detail information before planing go to travel to Vietnam. Hope you have an amzing trip in our beautiful country. And do not miss our next posts about Vietnam Popular Destinations soon. See you next time.